🌸 We can follow this cycle of growth and awakening in ourselves, too. Our mantra today is #intention — take some time this evening to make a list of five intentions that you wish to carry out over the next month. Your intentions can range from deepening your relationships to becoming creative with your meal preparations — however your list evolves, these intentions will help you ground into this time of growth. ✨ One of our intentions is to prepare our meals with wholesome ingredients each day to keep our body and spirit nourished. 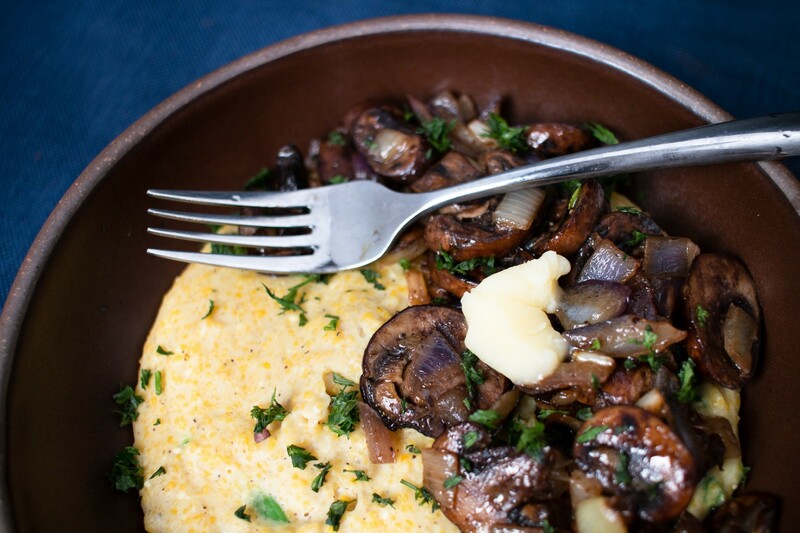 This vegan polenta with sautéed vegetables is a simple and savory delight to eat! Let us know how much you love it. Chop onion and slice mushrooms. Using 1–2 tbsp of olive oil, sauté onions and mushrooms on medium-low heat until they become partially caramelized. Cover to keep warm and set aside. Using cornmeal, water, almond milk, salt, and pepper, prepare polenta in accordance with directions on packaging. Remove polenta from heat. Add nutritional yeast, garlic powder, and CBD Superfood Ghee. Taste and add salt and pepper if necessary. Fill a bowl with a cup of polenta. Top with sautéed veggies and minced parsley. Eat while hot and enjoy!